Lately, Emily has found it difficult to face going to the grocery store with all three kids (I certainly don't blame her). On her last attempt earlier this week she bailed and came home. The threat of a weekend without milk helped us rally our might and we went together. We decided to divide and conquer. Lila was with me. After fighting about why it isn't OK to put one foot on the cart and hop a long on the other, Lila and I finally settled on this compromise. The best part (besides the fact that Zack only has one shoe on) is that we didn't take these photos. We got them when we noticed a nice women taking pictures of Lila with her iPhone. I told Emily to ask her to email us the photos from her phone. This is the spectacle we have become, we are camera phone material. WOW - what an honor! At first I thought it a little strange that you took your camera to the store! I know what you mean about the store thing - we usually end up going very late at night after the kids are in bed. Thank goodness for 24 hour grocery stores! Ha ha ha. That's hilarious that someone was taking pictures. Did she ask you first? Was she thinking it was cute or irresponsible? oh my gosh how funny. i really like your blog because it is real and it makes me feel normal :o) i can totally see my kids riding under the cart like that...and for sure one of them would only have one shoe on. too good! That is hilarious. Jeremy and I are dying laughing out loud right now. Thanks for letting us enjoy that awesome song. You are such a great spectacle to see and I'd be caught being seen with you any day. Go Lila Go1 You guys are awesome! I am jealous that I have never thought of that! 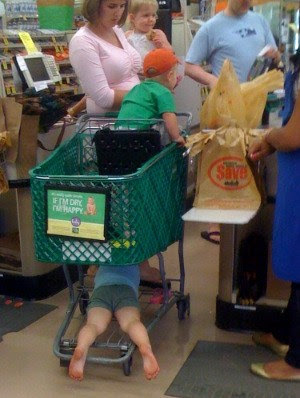 I actually do let my kids just hang off the sides of the cart and run around with no shoes on(i.e. Costco 3 days ago)-and I don't give a crap if people stare at me. Did people keep telling you over and over again "your son is missing his shoe". Oh the memories this brings back. I ALWAYS had someone riding under the cart like that, one in the seat, one in the cart, and sometimes one on my back in a Gerry carrier. I'll never forget when the baby in my backpack grabbed a big bottle of wine and busted it all over the floor. White trash all the way. Just wait until the kids get older and race empty carts up and down the aisles, put "ripe and ready to eat" stickers on your behind when you aren't looking, or carry a six pack through the store announcing really loud, "Mom, you forgot the beer!" "This is the spectacle we have become, we are camera phone material." Okay, that has to be up there on the 'best quotes' from a blog, ever! Love it! When my twins were the ages of yours, the only place I could shop was Costco. The double seater carts are totally worth the membership fee and extra hundreds of dollars you spend there over the grocery store. Seriously. I agree about the classic quote, quite the writer you are, JRoc! Shayna told me I HAD to check your blog, and this post didn't disappoint! This is hilarious! I miss you guys! I thought your post was funny, but then I read what your mom commented and cried I was laughing so hard! Thanks for the memories! Ha ha. Cute pictures. I feel for you Emily. I don't know how you do it with twins. You are an amazing mother. I also loved Liz's comments. Hiiillarious! Seriously, I'm totally laughing out loud. Yep, the store with the kids is something I can only take on when I'm feeling very brave and optimistic and in your case camera ready I guess . . . I thought of your post on Saturday while I was battleing my children through the grocery store. It is always nice to know that we are not alone. I absolutely LOVED this post!!! I think I might actually try this! Tell you what...I always thought it would be cool to have twins, but I'm startin' think one at a time is great!! That's hilarious!! 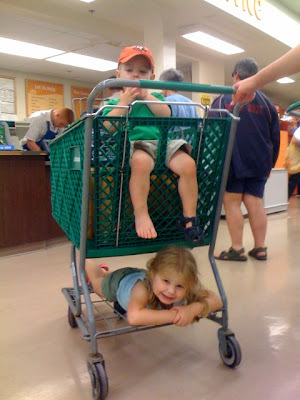 We've done the "under the shopping cart thing."